Social media is a powerful medium for the promotion of your business. You can easily share your product, new ideas, innovations on social media. The primary reason for this promotion is to drive more traffic to your website and increase the sales of the goods/services. As a blogger or business, you must have a Facebook page, Twitter, Google plus, LinkedIn profile to get in touch with the customers and readers. It’s very to difficult to manage all these social networking sites and post content regularly. We can’t avoid it either as it’s crucial for our business. What if we can manage all our social network from single tool it will save your time for publishing the content on social sites. By considering all the above factors, some companies developed tools for us like Hootsuite, Buffer, Sprout Social, etc. These tools allow you to manage all your social network from a single place and even you can publish the content from a single dashboard. HootSuite is the most popular social media managing tool that we have. It comes with three versions free, pro, premium. Offcourse free version has some limitation as you can connect only three social profiles. If you don’t want to invest money in content marketing, then the free version is sufficient for small scale business/blog. For the personal blog, we don’t need to promote our content frequently. So you can starts with the free version and connect Facebook Page, Twitter, and Google plus profile to promote content. I think these three profiles are sufficient for promoting content. HootSuite provides us web-based dashboard, analytics, post scheduling for the free version also. The free version offers three social networks which are sufficient for a small blog. You can connect Facebook, Twitter, Google plus top popular social networking sites. The web-based dashboard comes with comprehensive analytics. Offers to the schedule of content. You will get browser extension for HootSuite. You can send as well as receive messages from your fans in HootSuite. 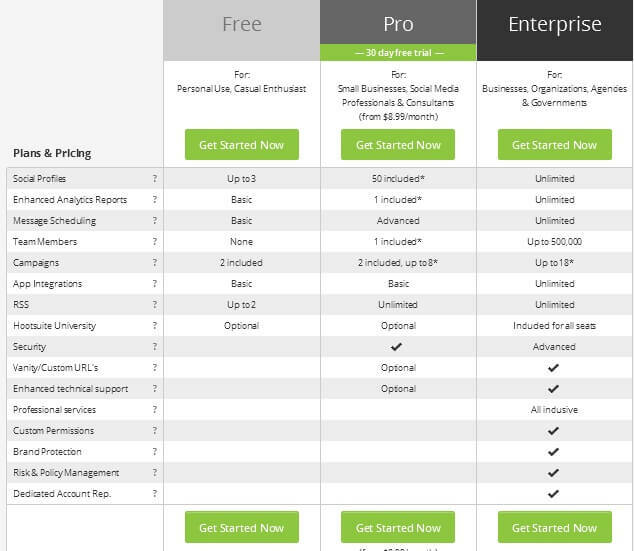 The Pro version price is more as a small business can’t afford it. The free version will provide you limited features, and even pro versions have limited features. The second most popular social media management tool is a Buffer. It offers you fewer features than HootSuite. The free version of Buffer won’t allow you to post on Facebook after limited post share. 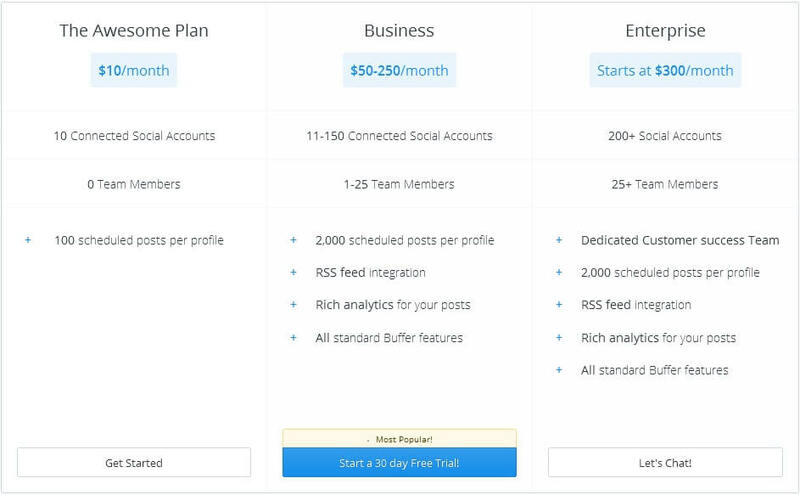 Buffer comes with three plans Awesome plan, Business, Enterprise plan. Buffer pricing is more than HootSuite, and it provides a less social network to connect as well. In HootSuite, you can connect 50 social networks with less price, and in Buffer, we only connect ten social networks. The free version allows us to connect three social networks for a limited period(After limited post-Facebook needs an upgrade, I don’t know why this happens). Plugins are available for browsers. You can schedule your post as every tool offers it. Android, IOS application available in the market. Free versions offer limited social network connections. Pricing is high compared to others. Less social networks connect with the same price that HootSuite offers. After comparing all features, pricing, the social network connects I found that HootSuite is better than Buffer as HootSuite provide more social network connect compared to Buffer. Coming to pricing HootSuite is less expensive than the Buffer. That’s it. If you have another opinion about this tools then let us know our readers, do comment on it, thanks. If you know another social media management tool then let us our readers know. If you like this post then share this knowledge with your friends.